It’s finally time I guess. They can’t stay forever. It’s fantastic that they’ve been here since late August, helping out with the chores, with Sophie, offering the wife support, offering me support when I was in the hospital. They’ve endured a torrid Autumn and a (thankfully) mild Winter here. Overall, it’s been a good 5 months. Yes, my mum and auntie left for the warm shores of Malaysia on 9th January. To say that our tiny flat is now much quieter is an understatement. While they helped the wife and I (especially the wife) out a lot, they were there for her emotionally as well. The wife definitely felt the void when they left. But the one person who missed them the most was Sophie. She was only 3 weeks old when they came. She was quite a handful then, crying almost non-stop every day. But they adored Sophie and doted on her. Sophie adored them too and when they left, the poor girl was looking for her Mama (grandma) and Guma (grand auntie). She cried inconsolably for nearly 90 minutes the afternoon they left. Babies are habitual, and she’s gotten so used to falling asleep on Guma’s shoulder in the afternoon that no one else would do. We finally managed to calm her down by sitting her in front of the TV and getting her to watch ‘Deal or No Deal’, a game show that my mum and aunt used to watch in the afternoon. She was OK after that (thankfully). It’s going to be harder and more tiring for the wife and I to look after Sophie now that we’re short of 2 pairs of hands, especially now that I’m going back to work a few days a week. But as parents, we have to do it. We managed it before they came, and we sure can manage it now. Plus she’s a lot easier to look after now. Anyway, like I said before, they can’t stay forever. We were very fortunate that they’ve stayed for so long and helped out so much. For now, we just have to get back into the routine that we had before. 🙂 It’ll be good. Since I’ve been home, I’ve been having a blast spending time with the family and with Sophie. Sophie is a joy, and seems to be throwing up all sorts of surprises every day. She’s changed so much since I last saw her, and is a lot more cheerful, happy and active. She’s also smiling, playing and interacting more than before. It’s so much fun to be around her. But being home after nearly a month away means having to readjust to the baby. 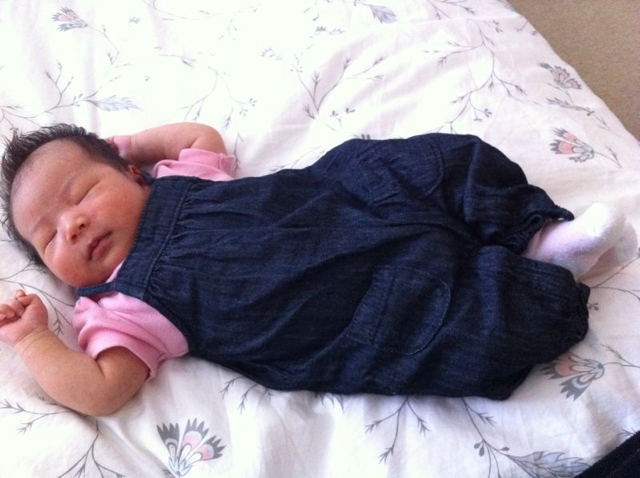 When Sophie first came home, the wife and I had massive issues sleeping at night. The fact that Sophie used to wake every hour or two to feed meant that we would probably get a maximum of two hours sleep at a stretch if we’re lucky. But that’s the theory. What normally happens is that you try to got to sleep, but knowing full well you’ll be awake again in a couple of hours, you don’t really fall asleep. So you don’t really get any sleep. The wife and I learnt pretty quickly to fall asleep after Sophie’s feeds, and only wake when she started crying. At least we would get a few hours of sleep in between feeds. Then there’s the noise. Sophie (and most other babies, or so we’re told) makes a lot of noise in her sleep. We called this the ‘Sophie zoo’. When she first came home, we were always waking up to check on her cos it sometimes sounded like she was choking or had difficulty breathing! 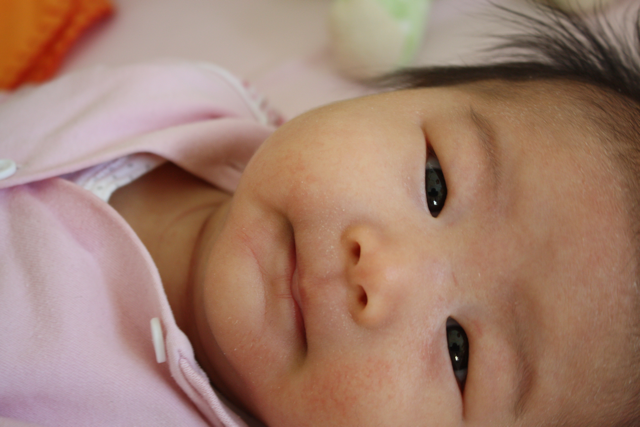 But eventually we learnt to sleep through the sounds she makes (except when she cries). After 4 weeks in the hospital, I find myself having to readjust again to the ‘Sophie zoo’ and sleeping patterns. I wake up at the slightest noise and have difficulty falling back asleep after her feed. Back to square 1 I suppose. But since Sophie is a lot older now, she is able to sleep a lot longer through the night. It would be easier to readjust back to sleeping after feeds than it was. I also found out that I will need all my inoculations again. So everything from the BCG to whatever I had when I was an adult (I can’t even remember). The staff here will prepare a list of jabs and the dates, and I will need to make an appointment with the GP to get that done. Not looking forward to it, not that I hate jabs (after the Asparaginase jab, nothing can be quite as painful), but the effect of the jab may make me very ill for a while. More good news, is that the consultant on the wards this month, Dr Kampher reckons that I am doing very very well, and if nothing goes pear shaped, I can leave by the end of the week. That’s if my blood counts continue to go up, I maintain my weight and I don’t have any infections or GvHD. Oh how I missed my little baby girl. I reckon that it’s been at least 2 weeks since I last saw her. 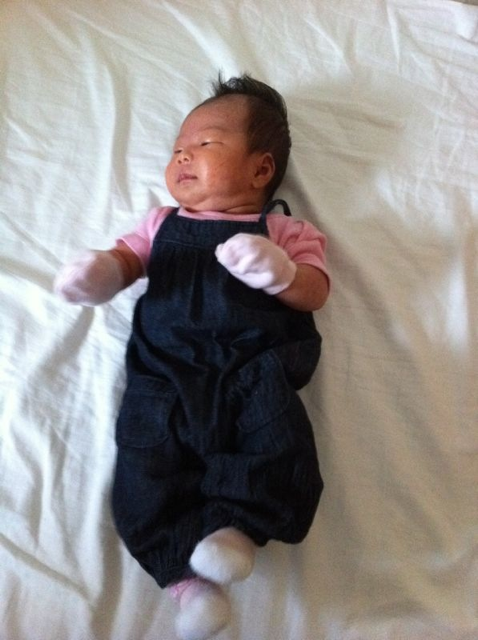 I saw her on 8th Sept, for her 1 month celebrations, and then I became neutropenic so I wasn’t able to leave the room. So yes, it’s been 17 long days of not seeing, holding or kissing my baby girl. The doctors also spoke about discharging me, as it was close to the time. Basically, my blood counts have to come up to a point where they (the doctors) are happy to let me go. This is usually 1.0 for transplant patients, as they’re a little more cautious about discharging transplant patients than they are chemotherapy patients. Also, the dietitian has to be satisfied that I am getting all the nutrition that I need from eating and drinking normally. So for the next few days, they’re not going to feed me via the tube and monitor my weight. If it maintains at a certain level, or goes up, I can go. 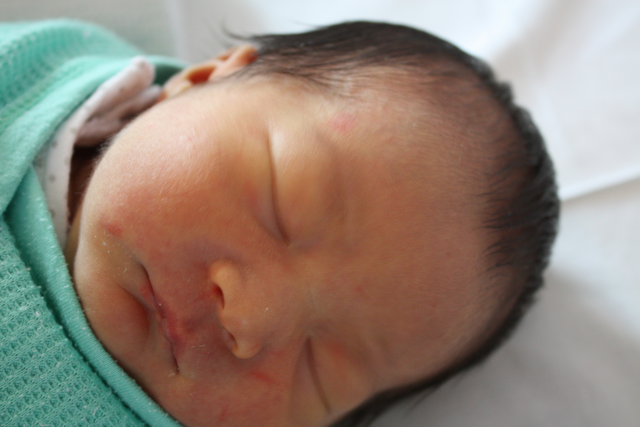 The doctors let me head home again for Sophie’s first month on 8 Sept, for a few hours just to spend some time celebrating with the family (the bro’s here from NYC too) and to have some traditional Foochow long life noodles and red eggs. I had a wait a little longer due to the consultant ward rounds, which happens every Thursday, but happily I was able to get out by about 6pm. 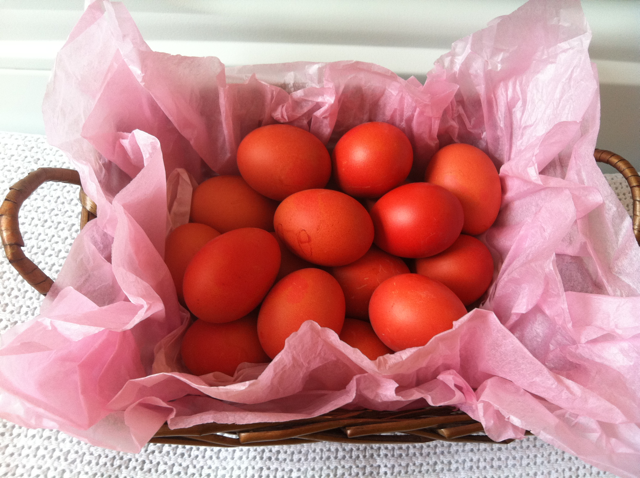 My mum and auntie brought some red eggs over to the ward to share with the nurses and staff here. It aroused a lot of curiosity, as many of the staff here are from India and the Philippines, and don’t know much about Chinese traditions. So I had to, in my own limited way, explain it to them. Not that I did a very good job. Got home just in time to top-and-tail the little one, who was very cranky for some reason. She was fussing and crying on and off non-stop making it very stressful for the wife to handle. We think it’s a phase or perhaps another growth spurt. But eventually we were able to get her settled enough to have a relatively peaceful dinner, interrupted only by a nappy change and a staccato of cries. But she was looking cute that day, all frocked up for her big day. This jump suit was on offer at Baby Gap for just £4.99. Couldn’t resist. But when we tried dressing her in it, we realised why it was going for that. It had buttons all over the back of it. Buttons, not the push button type, but proper, adult buttons. The type an adult can’t manage after a few drinks at the put. Whoever designed this item for babies should be hung, drawn and quartered. And fed to the sharks.